Runners proceed north on Langhorne Road, downhill for 1.5 miles. After a short distance on Rivermont Terrace, runners turn east onto historic Rivermont Avenue. The 4 Miler participants finish at Randolph College, 1/4 mile from Rivermont Terrace. The 10 Miler participants continue down Rivermont Avenue and follow the course clockwise through Riverside Park overlooking the James River. Runners return same route finishing up the infamous, 1.5 mile “Farm Basket” hill. 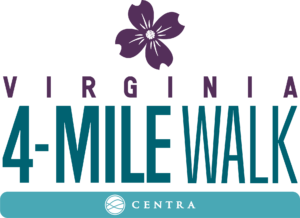 The Virginia 4-Mile Walk presented by Centra Health is a point-to-point course. Runners and walkers will be provided with optional bus transportation back to E.C. Glass High School from Randolph College. Participants may have to wait for buses and are encouraged to coordinate alternate transportation if desired. Transportation is provided for participants only. There are no awards for the 4-Mile Walk. However, participants will be given a time and place. This is a non-competitive event. Rules of “race-walking” will not be enforced. Commemorative Finisher Medals to all that finish the Virginia 4-Mile events. Event t-shirts are guaranteed to those that register by Sept. 1. Registrations received between Sept. 2-25 will receive shirts on a first-come first-served basis at packet pickup. After crossing the finish line, all race participants will gather at E.C. Glass H.S. for plenty of complimentary food and beverage, music, and massages. Bring your family to enjoy the variety of post race activities and awards ceremony. Live bands and music will be located throughout the courses for both races. Runners will be treated to more than 5 live bands and DJ’s. Neighborhood parties are also being organized on the course.